Al images: Courtesy, Her Majesty's Royal Collection, English Heritage and The Osborne House. Early Monday morning sees us heading southwestwards from London. Our ultimate destination: the Isle of Wight and Queen Victoria's private palace - her "home away from home" - Osborne House. The port and harbour of Southampton, a mere 80 miles away, were where most visitors to England first landed for centuries. It was here that Duleep Singh, the exiled child Emperor of Punjab, arrived in 1854, on his way to London. Hurtling down the English countryside, we're not far from Thomas Hardy country - Dorset and Dorchester - where his Tess of the d'Urbervilles had her run-ins with fate and destiny. This is where Lawrence of Arabia was born, and where he lies buried in an almost unknown country graveyard. His life deserved a home at Westminster, but he had crossed the paths of too many a Brit empire-builder to be given a fair shake. Not to worry; David Lean and Peter O'Toole brought him alive in 1960 and helped him overshadow every general before or after him. We take a ferry from Southampton and sail across The Solent, the narrow strip of the English Channel which separates the mainland from the Isle of Wight. The ferry disgorges us at Cowes. A mile away, we enter the grand estate which was the home for more than four decades of the Empress of India who, from time to time entertained, mother-like, the last Emperor of Punjab. 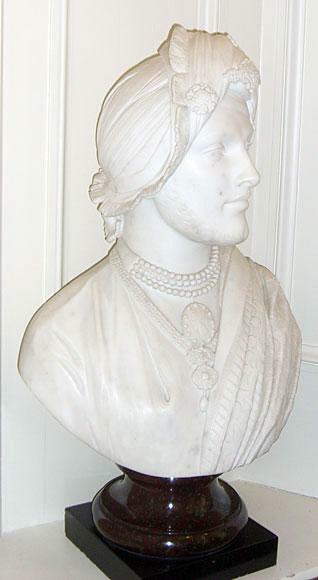 The young Queen and her husband, Prince Albert, had bought Osborne House in 1845 to get away from the hustle and bustle of metropolitan London - the same time the infant Maharaja Duleep Singh and the Regent Queen Mother, Jindan, were struggling in the distant Kingdom of Punjab against the secret machinations of the treacherous Dogra brothers and the scheming East India Company, lying in wait vulture-like across the Sutlej. Prince Albert, inevitably overshadowed by the Queen, was anxious to make his mark on his household. One of the many things he got involved in was the designing of the new and expanded Osborne House, which was completed - in the style of the Italian Renaissance - in 1851. Tragically, he did not live long to enjoy his creation and the many engineering innovations he brought to Osborne: he died in 1861 and left behind a Victoria who mourned him, in black and veil, for the remaining four decades of her life. Two years later, Duleep Singh - now a young man, married and starting a family - bought Elveden Hall in Suffolk - a 17,000 acre property which was later increased to 22,000 acres - a short distance from Cambridge in eastern England. Consistent with his surprise and innocent remarks when he first saw Buckingham Palace - "Is this how your maharajas live? Can't they afford better?" - he immediately went about expanding Elveden and re-doing it in the style he had been accustomed to in Punjab. The result was an exotic palace unlike anything else in England or Europe. Before long, Duleep Singh and Elveden Hall began to play host to the glitterati of Europe ... an invitation to his palace or to a hunt on his grounds became the ultimate status symbol for princes and dukes and whatever from both sides of the Channel. The British royal family were frequent visitors and, like everyone else, were in awe of the Punjab-manque that the young Maharaja had created in their own land. In 1877, Victoria was proclaimed Empress of India. But confined to a self-imposed exile since 1861 in a perennial mourning for Albert, she yearned to see India ... but couldn't. 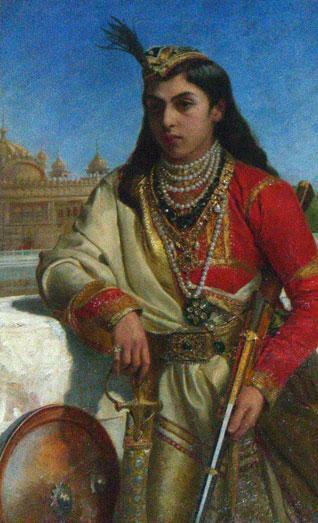 So she commissioned a painter, Austrian Rudolf Swoboda, to travel through India on her behalf, painting its people ... "... and bring India to us, since we cannot be there!" When in Lahore, he met an extraordinary architect and designer: the Vice-Principal of The Mayo Art College, Bhai Ram Singh! Back in England, Victoria was dazzled by what he brought back and wanted to showcase the Jewel in her Crown: India. She was familiar with the exoticism of Elveden Hall - not only had she and the Prince of Wales often visited it, but there was an ongoing friendly rivalry between the two families over Elveden. Victoria, not so secretly, coveted Elveden Hall, and dreamed of acquiring it one day as an alternate royal residence. But Duleep was ensconced in it, and liked living there. So, when the idea of having a Durbar Hall wing added to Osborne first germinated - in the late 1880‘s, Victoria thoughts immediately went to Elveden Hall. It was also an opportune and convenient time to imitate the style of Duleep's palace. 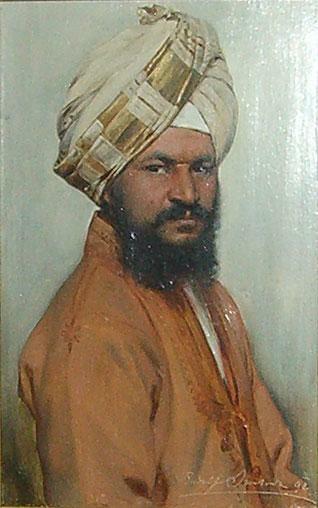 Rudolf Swoboda recommended Bhai Ram Singh to Queen Victoria as chief architect and designer of the Durbar Hall. Ram Singh was summoned from Lahore and given the commission. 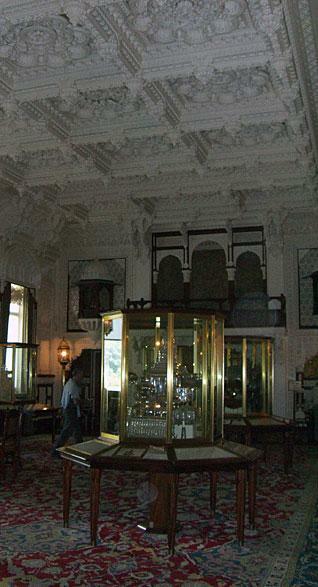 The Durbar Hall was completed in 1891. It became the durbar where Victoria received dignitaries from around the world during the final decade of her life and reign. Today, it remains the chief attraction for visitors who come by the tens of thousands to see the home of Queen Victoria, the respective personal rooms having been kept and maintained "untouched" since the death of Prince Albert and of the Empress herself. Next to him is a magnificent portrait of Duleep's younger son, Frederick Duleep Singh - in his teens. Also by Winterhalter. Not far are mini-portraits of Duleep Singh, a couple done by Queen Victoria herself, in water-colour. Swoboda's vignettes from India fill up the walls surrounding the Durbar Hall. Standing amongst them is a striking white marble-bust of Duleep ... by renowned 19th century sculptor, Count Marochetti, and commissioned by Victoria personally. Though there is space for only a fraction of the Sikh and Punjabi images in these halls, they are nevertheless a veritable feast, topped at the very end, by a regal one of Bhai Ram Singh himself. There's also a photograph in the Durbar Hall of Bhai Ram Singh actually working on the blue-prints in the very same hall while it was being constructed. A tour of the private apartments of the Queen prove to be an added delight. It gives an excellent glimpse into the private life of a British monarch, and provide a striking contrast to the grandeur of the private apartments (Sheesh Mahal - the Palace of Mirrors" - the Diwan-e-Khaas, the Diwan-e-Aam, et al.) of Maharajas Ranjit Singh and Duleep Singh in Lahore. A walk through the gardens at the back are a must: they provide a grand view of not only the House, but also the sprawling grounds leading down to The Solent, and the distant sight of mainland England. If you go down the semi-circular staircase in the "back-yard", you may find yourself in the very nook where Duleep Singh himself posed for the famous photograph of him as a teenager, looking sad and forlorn into the distance. Christie Campbell, author of the latest bio in the market on Duleep Singh - The Maharaja's Box - arrives on cue as we finish our tour, and gives us a delicious collection of anecdotes on the trials and tribulations of the Emperor in exile. Campbell's tale is one of conspiracy and counter-conspiracy; of how British spies followed Duleep Singh everywhere, through life and even in death, and whisked his body back to England even before it had turned cold ... all because they dreaded that his return to Punjab, dead or alive, could possibly lead to the toppling of the Raj. True, they outwitted him and all the schemes cooked in Ireland and France and the United States and the Middle-East ... and, of course, Imperial Russia! But Campbell also provides one of the key clues to how the British government always managed to stay a step ahead of him: they had ensured, Campbell reminds us, that he would never get the proper education he needed and yearned for; that growing up in the close company of the likes of the then Prince of Wales (who later became King Edward VII), all he learnt was a life of decadence. It was simply too late when his eyes were finally opened, first by his dying mother, Rani Jindan, and then by the emissaries of the "Singh Sabha Movement" that belatedly arrived from India, telling him of his true Faith, of his glorious past, and of the great heritage of the Sikhs! The die had already been cast. First published on July 28, 2008; re-published on October 20, 2014. 1: Gurpal Singh (Bilston, United Kingdom), July 29, 2008, 9:50 AM. I used to teach at Cowes High School on the Isle of Wight back in 1995. I was only vaguely aware of Osborne House at the time from local literature and regret not being able to visit! 2: Gurinder Singh Bajheree (Australia), August 07, 2008, 9:00 PM. Hey, you have done wonderful work by highlighting Punjabi virsa in London ... I was just wondering whether Maharaja Duleep Singh's family is still in U.K. today. If yes, where are they? I know it sounds bit stupid. But your article made me think of this. Hope you will reply as soon as possible, S. Sher Singh. 3: Gagan (Chandigarh, Punjab), June 07, 2010, 6:46 AM. Hi, I am his great grand son.